Calvin Johnson was born in Newman, Georgia, a town near Atlanta. His parents, Calvin and Arica, were no-nonsense people and according to young Calvin, “worked hard and raised us right.” There weren’t going to be any Cs on those report cards in that house! His mom didn’t want him to get hurt so he had to play Little League baseball until he got into high school. Finally, when he was fifteen and “stood 6 feet 4 inches,” he began to play football at Sandy Creek High School. Even though they were a running team, Calvin was able to start honing his skills as “the Patriot’s wide receiver.” He was on his way and college coaches began to notice him. One of them was Chan Gailey, Georgia Tech’s Yellow Jackets coach. Calvin Johnson picked Georgia Tech and “was an instant star.” He was amazingly agile and when thrown an unusual pass, “he reached back and squeezed it with his big right hand.” Calvin was working hard, and by the time he was a junior “he was unstoppable.” It was time for him to move on to the NFL after winning the Fred Biletnikoff Award and shattering school records. The Detroit Lions were ready and waiting for him. 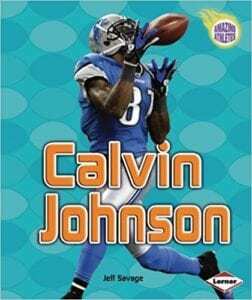 In this book you’ll find out about his family life, you’ll read about many of his games, why he went to Bolivia, his $64 million contract, how hard he worked, his selection to the Pro Bowl, and you’ll learn many other interesting things about Calvin Johnson, an amazing athlete! This is a fascinating look at wide receiver, Calvin Johnson, football’s “Megatron.” Many young football fans are familiar with Calvin, but will enjoy reading more about his life and the games he played. The book is loaded with full-color photographs, many action-oriented. Words that might be unfamiliar to the reader such as “end zone,” “running back,” or “wide receiver” are highlighted in purple and defined in the glossary. There are numerous informative sidebars and captions that add additional information. In the back of the book is an index, a glossary, selected career highlights (2002 to 2011), and additional recommended book and website resources to explore. Quill says: If you have a young football fan who is way into the Megatron, you just might want to add this book to your list!